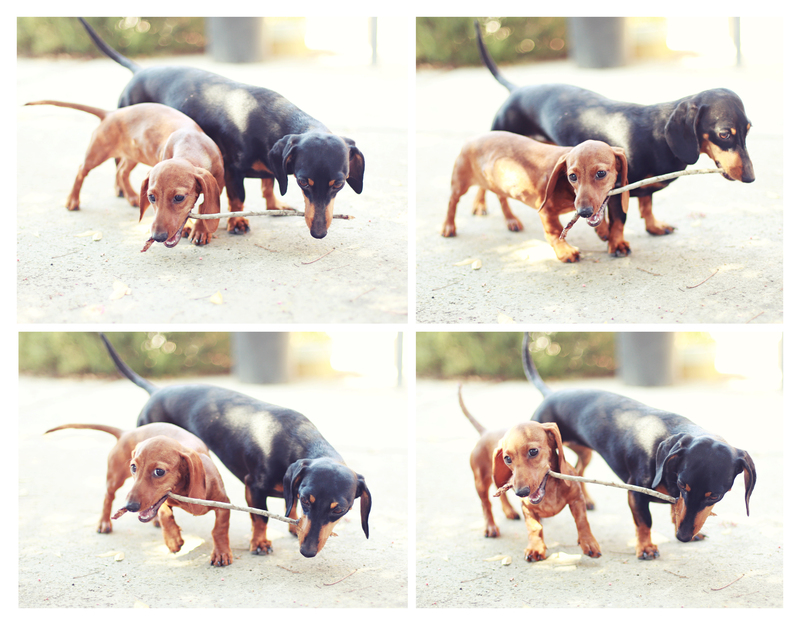 Dachshunds (and probably dogs in general) love sticks. 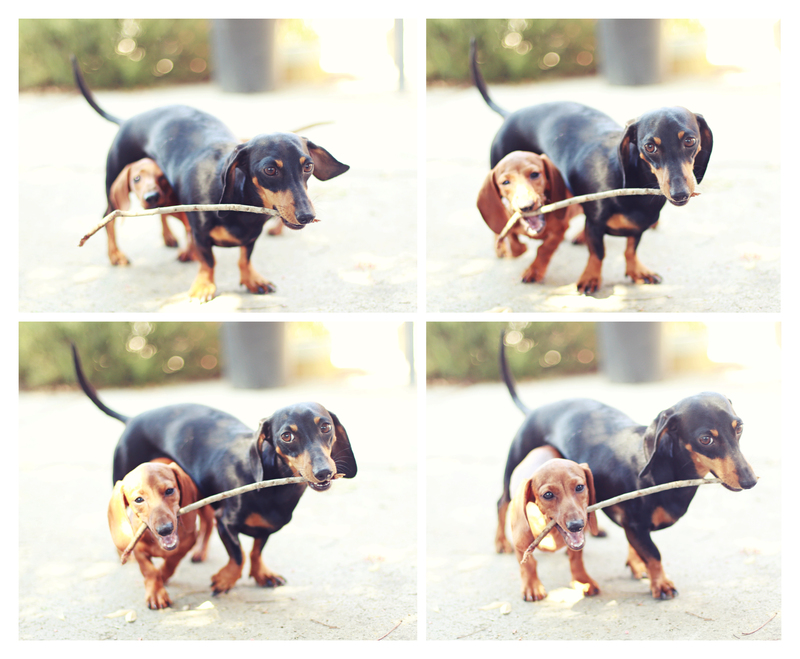 Despite my continued protest they insist on chewing on sticks. I provide an array of other chew toys, but apparently nothing is as good as an old fashion stick. I’m constantly taking them away from them but… on occasion I’ll let them play with it while I snap a few photos. How about yours, do they likes sticks?! Oh I Love these pictures…The Girls are so cute together!!! Emily will surely miss Lilly when she is adopted..and I am sure Lilly will miss all of you!….Still sure 2 is you limit huh???? LOL! I did put in an application for Lily and I guess you have so far rejected all applications. People can be home all day and still not be the right choice for any critter, because of their inability to provide a loving home. My dogs are spoiled and happy and yes I work. I am sad that I have been eliminated for reasons that make no sense to me. However I hope she finds somebody to your expectations before she is to old to truly bond with the person or people that take her God bless you all for the work you. Gretchen is an inside dog for the most part. Outside she will roll in anything smelly. Inside she will hunt down a bug by some kind of trail it leaves. Florida has tons of bugs so she keeps busy. She grabs the bug in her mouth, crunches it and then spits it out. She repeasts this until the bug is dead. I praise her and thank her for protecting me. Suzanne PS The stick thing seems to be a puppy thing but I think they love sticks because they are soft inside and they can tear them up. Dori does but Frieda not so much. It’s hard not to just let them chew, they enjoy it so much! Jamie – you need to followup with Dachshund Rescue and Placement. We at ROTW do not receive or review applications. I know at least one is under serious consideration but I’m unaware of the details at this time. Please contact them directly for updates at http://www.doxykeeper.net/ – I don’t know that they promise to reply, but click on the contact tab and see if they’ll write you back. Perhaps you’re in the maybe or decline pile – I honestly don’t know, but think you’re a winner for just submitting your application. 🙂 Thank you!